OAKLAND, Calif. (KGO) -- Security was heightened Thursday around all of Oakland's synagogues after anti-Semitic graffiti was found on the side of a temple in the morning. "We do hope this year is a year of peace and friendship," said Rabbi Jackie Mates-Muchin addressing a large group at Dimond Park in Oakland. But the usual celebration is somewhat tempered. It's hard to ignore the hateful, anti-Semitic words spraypainted on the side of Temple Sinai Thursday morning. "It seemed like a very cold and calculated thing," said Temple Sinai member Joshua Kuluva. It was an attack, felt by even the youngest members. "It's crazy because, why would anybody do that," questioned eight-year-old Gali Silverman. "How hurtful it is, and it feels even more hurtful on Rosh Hashanah." Oakland police will stay close to the temple for the time being. In the meantime, Temple Sinai's rabbi placed a blank piece of paper over the vandalism. 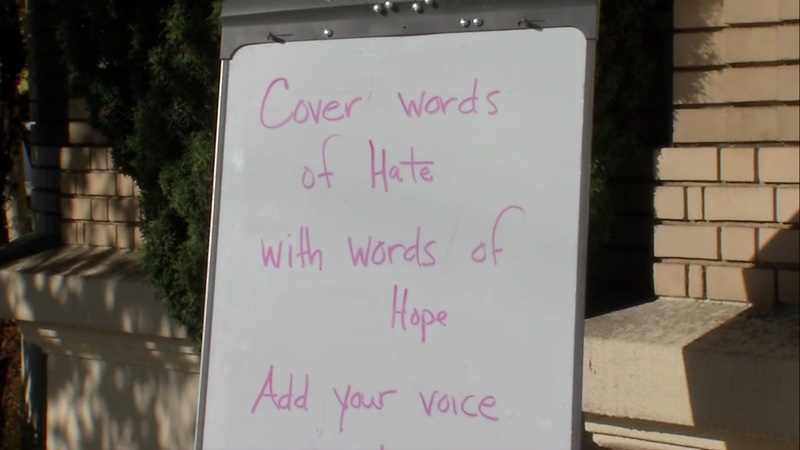 People were asked to cover the words of hate with words of hope. Soon the paper was full of messages. "I put love on it -- then a Jewish star, and I put a heart," said six-year-old Lev Kuluva. Oakland's Jewish community has been coming to Dimond Park for 23 years in honor of Rosh Hashhanah. Members tell ABC7 News it's never been so important to come together on this day to show solidarity.